This week, Chris and Joe are taking on an obsessive fan - it's 1990's classic horror, Misery! 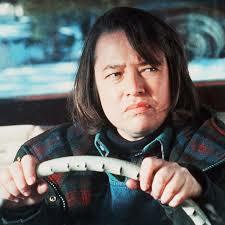 Misery is adapted from a Stephen King novel of the same name, and tells the story of Paul Sheldon (James Caan), a writer who is kidnapped by his number one fan - Annie Wilkes (Kathy Bates in an Oscar winning performance). As this thriller progresses, the question turns from survival to escape, making it a natural choice for us to discuss. We talk about one of the finest vocabularies of any movie character in history; the lack of initiative shown by a small-town sheriff with ideas above his station; and the fine line between being a likable person and inviting your own gruesome murder. As ever, send your suggestions to howtosurviveshow@gmail.com, and remember - the penguin faces due South.